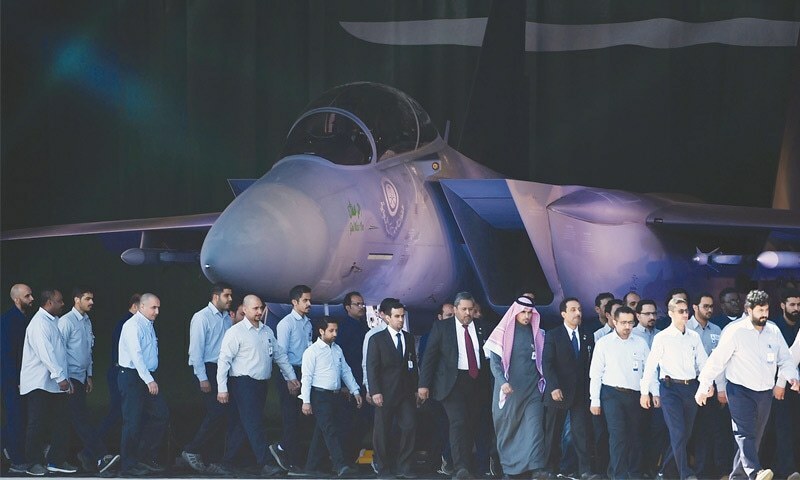 Watched by King Salman and his son, Defence Minister and Deputy Crown Prince Mohammed bin Salman, the unveiling at the King Faisal Air Academy was part of a ceremony to mark the school’s 50th anniversary and the graduation of its latest class. Sudan’s President Omar al-Bashir, whose country is part of the Saudi-led coalition fighting rebels in Yemen, also attended. The coalition began air strikes over Yemen in March 2015 after Iran-backed Huthi rebels and allied troops loyal to ex-president Ali Abdullah Saleh overran much of Yemen. Riyadh feared the Huthis would seize all of Yemen and move it into the orbit of Shia Iran, Sunni Saudi Arabia’s regional rival. According to IHS Jane’s Defence Weekly, the first of the F-15SAs — the most advanced version of the Eagle built so far — arrived in December. Saudi Arabia also has Eurofighter Typhoons and Tornados, which joined several F-15s — including the newest version — in the air show held over the skies of Riyadh. The Stockholm International Peace Research Institute reported in April that Saudi Arabia was the world’s third-largest defence spender.